Yum, really tastes great and low on the glycemic index. Seems I take a lot of my food cues from Best Life magazine. A recent issue mentioned agave nectar as a substitute for refined sugar, and I'm trying to cut my use of refined products of all stripes, so I ran to Whole Foods and bought a small bottle of Madhava agave nectar. I was hooked immediately. The consistency is thinner and the taste is lighter and milder than honey, but I use less to get the same amount of sweetness. I normally use it in my tea (Celestial Seasonings African Tea, Madagascar Vanilla Red, Tea Bags, 20-Count Boxes (Pack of 6)), but I have also put it on whole-grain waffles (and I've been known to just take a swig when I need a shot of something sweet). As a bonus, it doesn't crystallize like honey does. No more refined sugar for me! I love this stuff! It has replaced refined sugar in my diet for the past two years and allowed me to break my "sugar addiction" cycle, since it doesn't cause my blood sugar to spike & drop. It can be used as a sugar replacement in most recipes. 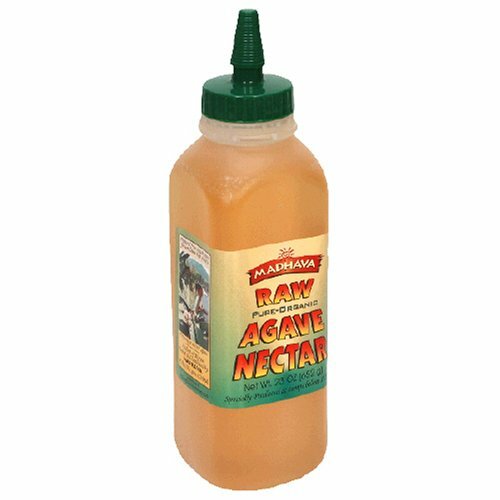 This is definetely the best tasting agave nectar I have come across thus far. While I do not believe that agave has much nutritional value (it is also a simple sugar), I still do not see how it can be so bad for someone's health when used in moderation. It certainly is not worse than sugar. I have used agave in recipes, adding only 1/4 a cup where over 1 cup of sugar was needed. This significantly cuts the calories while maintaining a sweet flavor. I would caution anyone against using too much of anything, whether it's a natural or artificial sweetner. In the end, one should take empty calories and simple sugars at face value. However, when given the alternative and possibility to use this great sweetner in moderation, I would recommend it against table sugar. You definetely end up using less, and it even tastes better.